I want all medical treatments (Western, Eastern, herbal, alternative) to work all the time with 100% effectiveness. Who would not want this? That would be a great world! —where everyone got cured all the time. I want acupuncture to work, and to work all the time, for everything it is used for. Doing science-based medicine is a lot like committing murder. There are these medical studies out there and when you first glance at them you really like them. You want to believe what they say. Then you start doing science. You take an ax and you chop off one leg, then an arm, pretty soon another leg, and then another arm. Pretty soon that study is dead. Often, it’s a very unpleasant death and emotionally unsatisfying. You wanted that treatment to work. You wanted the scientific evidence to be there! You wanted that treatment to be alive and well for the benefit of all humankind. Unbiased, objective, science-based medicine is hard. Evidence-based medicine is hard. You must be prepared to “kill your babies.” This means that you must be able to critique and destroy all those medical studies that you once thought were beautiful and deserving. When it comes to science-based medicine you must be able to kill your darlings: studies that look good at first, but do not deliver statistical certainty. Why do I digress before writing about acupuncture? Because it can be so emotionally unsatisfying to do science-based medicine that much of the world simply ignores science. But you are not alone. Others have had to toughen up before you. Because of the emotion sometimes involved, I have given a lot of background explanation before going into the science about why the Treatment Score = 0 for acupuncture for low back pain (at least in this prototype example). If you talk to people, all kinds of treatments for chronic low back pain are bandied about without any “specifications” about how well they actually work. Today it’s different. My physician colleagues and I are on a mission to quantify all medical treatments for all diagnoses. We have invented Treatment Scores (in this form). My goal is a simple demonstration of the concept of Treatment Scores, not to create the final product. It will take time to completely develop the Treatment Scores system into everything it needs to be. What is the Treatment Score for acupuncture for chronic low back pain? By my calculations, the Treatment Score = 0, based on reviewing only one randomized controlled trial as an example, which is why this is a concept essay and not a final product. 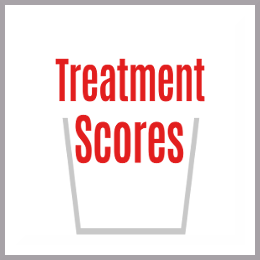 The Treatment Score = the net treatment benefit for the patient. Do you believe in shared decision-making? Reviewing acupuncture as a treatment for chronic low back pain creates a fantastic example of how shared decision-making should work in the real world. Medicine used to be a dictatorship (paternalistic or maternalistic). The doctor told you “the best thing to do.” With the rise of the Internet, we are starting to have transparency. You now have access to what used to be secret inside information. You and your physician can look at the data together and you, and him or her, can make decisions together. That’s shared decision-making! A colleague suggested a randomized controlled trial about acupuncture for chronic low back pain to me. I’m grateful, because reading the study has turned into an incredible lesson about the quality of medical studies. At first glance it looked like an amazing study. It’s a randomized controlled trial! There are 1,549 patients in the acupuncture arm of the study, there are 1544 patients in the control arm of the study. Interestingly, there were 8,537 patients who did not want to be randomized, but did still want to receive acupuncture, and the authors collected data on those patients. That’s an excellent twist to the study. The study found the “gross treatment benefit” for acupuncture for chronic low back pain at 3 months to be 9.4%. "Pragmatic randomized trial evaluating the clinical and economic effectiveness of acupuncture for chronic low back pain." by Witt CM, Jena S, Selim D, Brinkhaus B, Reinhold T, Wruck K, Liecker B, Linde K, Wegscheider K, and Willich SN. Am J Epidemiol. 2006 Sep 1;164(5):487-96. Epub 2006 Jun 23. The diagnosis = chronic low back pain. But that is not a specific enough diagnosis. Today we want personalized medicine. Therefore, we want to personalize the diagnosis as much as possible to the patient. In this particular situation, I wanted the diagnosis to align exactly with the patients in the study. The diagnosis = chronic low back pain (in patients with no bulging or herniated discs, no neurologic symptoms, no previous surgery, no infection, no inflammation, no cancer, no autoimmune diseases, and no congenital deformities). When you eliminate all these things, the diagnosis is basically common chronic low back pain in the typical adult who strained their back. The follow-up time period in this study was three months. The patients were treated, on average, with 10 sessions of acupuncture using acupuncture needles. The control group was not treated with acupuncture, but after three months without treatment, they were treated with acupuncture. This was another nice twist to the study. The main outcome measure of this study is the Hannover Functional Ability Questionnaire (HFAQ), which is a symptom score to quantify the symptoms of chronic low back pain. When doing Treatment Scores, we rate studies on a 100% scale. With 100 being a perfect randomized controlled trial. Normally, randomized controlled trials are rated (in the didecile) between 81 to 100 (Grade A) depending upon how good they are. In a single-blind study, the patients don’t know whether they are receiving the treatment or a placebo. In a double-blind study, the patients don’t know what treatment they are receiving, and the physicians don’t know what treatment they are administering. In a triple blind study, the patients don’t know which treatment they are getting, the physicians don’t know which treatment they are administering, and the people who are doing the medical statistics to report the results for the study don’t know who received the treatment and who received the placebo. Blinding is very important because it removes bias! Without removing bias you cannot get the truth. A placebo is a pill that doesn’t work. A placebo pill is also called a “dummy pill.” In the old days, it used to be a sugar pill. Today, a placebo may contain starch or saline, both of which are inactive. When it comes to things like surgery, a placebo is not ideal, because the patient can tell whether they’ve had surgery or not. Therefore, the highest quality randomized controlled trial will use “sham” surgery. An example of “sham surgery” of the knee would be where one group gets put under with anesthesia and then gets the real surgery, but the “sham surgery” group gets put under with anesthesia, but only gets a superficial incision without any actual internal surgery. An example of “sham acupuncture” would be where one group gets real acupuncture with needles in the traditional acupuncture locations, but where another group gets needles in “sham locations” that have nothing to do with traditional acupuncture. Blinding and Sham Control are Extremely Important! When I first read the abstract of the study I thought I was going to rate it 82% in quality. However, by the time I was done, I only rated the study 0%. To translate that, instead of rating this study 82 out of 100, or 82% in quality, I rated it 0%. That’s dismal. The reason the quality rating is so low, is because this study is not blinded or sham controlled. The patients know whether they got acupuncture or not, and they are subject to the placebo effect. They are very likely to report that they received benefit from the treatment when in fact the treatment was no better than placebo. The gross treatment benefit of 9.4% now has to be modified for lack of certainty. It could all be due to the placebo effect. Mathematically, the gross treatment benefit drops from 9.4% to 0%, because the mathematical certainty of the 9.4% being true is 0%. All this may seem counter-intuitive. The bottom line is that for a statistic to believable it has to be without bias and without the placebo effect. So, the gross treatment benefit that I can believe is now 0%. The placebo effect has been proven over and over again in medical studies. It has also been proven to occur with acupuncture. It’s a shame. The authors spent a lot of time and money doing this study. In many ways, the authors did a nice study. It is randomized; it is controlled. They have a method for handling the patients who refused to be randomized. But by not using blinding and by not doing sham control, they basically turned a randomized controlled trial into a low quality case series study. The gross treatment benefit they published basically cannot be trusted, because it can easily be attributed to the placebo effect. I’m unhappy acupuncture did not do better. I have a physician colleague who very much wants to believe in acupuncture. My preconceived notion was that acupuncture worked, perhaps only mildly, but that it worked. Maybe it does work for other specific diagnoses and based upon other randomized controlled trials. Eventually we will review every diagnosis and treatment using Treatment Scores. Using “big data” techniques and database technology every existing study will be able to be taken into account. This is not the last word on acupuncture, this is a demonstration about Treatment Scores in a specific situation using only one study. Treatment Scores are still in their infancy and there is more work to do. One of the goals of Treatment Scores is to eventually get all the most objective and highest-quality statistics possible as the starting point. If one wanted to get more detailed, the situation may be even worse for acupuncture according to what we know right now from this one study. The Treatment Score may be less than zero. Remember, I started out with a “gross treatment benefit” of 9.4%. Then when I took the quality of the study into account, the “gross treatment benefit” dropped to 0%, because the study was not blinded or sham controlled. But the whole purpose of Treatment Scores is to get to the “net treatment benefit.” You can see in the expanded Treatment Score Calculator™ below, that we have a gross treatment benefit of 0%. There were some other potential “positive side benefits” to acupuncture, as there was a 7.9% improvement on the Low Back Pain Rating Scale, and a 1.8% improvement on the Quality of Life Short Form scale. However, just like 9.4% improvement on the Hanover Functional Ability Questionnaire, those potential benefits also drop to 0%, because of the flaws of the study: no blinding and no sham controls. That leaves us with only the negative side effects with which to adjust the Treatment Score. When we take the gross treatment benefit of 0 and subtract the negative side effects, we are going to come up with a Treatment Score in the negative range. It’s hard for people to conceptualize this, because we are dealing with different scales. The main statistic on the left is on one scale, and the secondary statistics on the right are all on an “event rate” scale, and if you look at each statistic individually they are each on their own individual scale. It’s like gross income and net income. The main statistic on the left is in dollars, and you have to subtract the things on the right which are in different currencies: euros, pounds, francs, and pesos, to come up with the net treatment benefit, which equals the Treatment Score. I can easily justify a Treatment Score of -25%. That’s a negative 25%. For me, the time needed to go to acupuncture treatments is a huge negative. The effort to travel to acupuncture treatments when suffering from low back pain is a huge negative. The 54% incidence of bleeding and hematoma is a serious negative. The 21% incidence of unspecified side effects is a negative. The 17% incidence of pain from the acupuncture treatments is a negative. The 8% incidence of vegetative side effects is a negative. The above Treatment Score Calculator™ gives us the ability to do shared decision-making. The patient needs to have input on how much weight to give the side effects on the right side of the Treatment Score Calculator™. For example, one of the negative side effects of acupuncture is the time it takes to undergo 10 sessions. Each session may take two hours between travel time, checking in at the clinic, getting prepared for the acupuncture session, and then undergoing the acupuncture itself. How big of a negative all that time is will vary from patient to patient. However, when you have a Treatment Score Calculator™ like this you can discuss these issues with your physician and do shared decision-making together. This will help you to determine what the Treatment Score is for you, as opposed to somebody telling you what the Treatment Score is for you without knowing your preferences. In other words, you as the patient are now more powerful and can have input into the shared decision-making process. You now have the benefit of treatment transparency. This is only one demonstration example to show the potential of Treatment Scores. This is not the final product of what a Treatment Score will be. In this essay, we only used one randomized controlled study, not the entire body of existing medical literature. This was proof of concept. We have created a demonstration of how to do a Treatment Score. We have used one randomized controlled study to demonstrate that the Treatment Score for acupuncture for low back pain = 0 or less than zero (if we limit ourselves to the information from this one randomized controlled trial only). In the future, we will review the top randomized, sham controlled trials on acupuncture for chronic low back pain. We will see if the Treatment Score moves up or down when other studies are taken into account. It’s possible, for example, that physicians without any acupuncture training could place a few acupuncture needles into the lower back of patients with chronic low back pain and achieve all the benefits of the placebo effect, or even do better than the placebo effect. Such treatment might work just as well as acupuncture. Treatment Scores are in no way against Eastern medical treatments, herbal treatments, or any other form of alternative medical treatment. In fact, we want to report that such treatments work when the science says they work. We already have positive examples. Treatment Scores are for science, they are not for or against any treatment or treatment philosophy. May be the Acupunturist was not competent in that study?? Just an alternative explanation possibility?